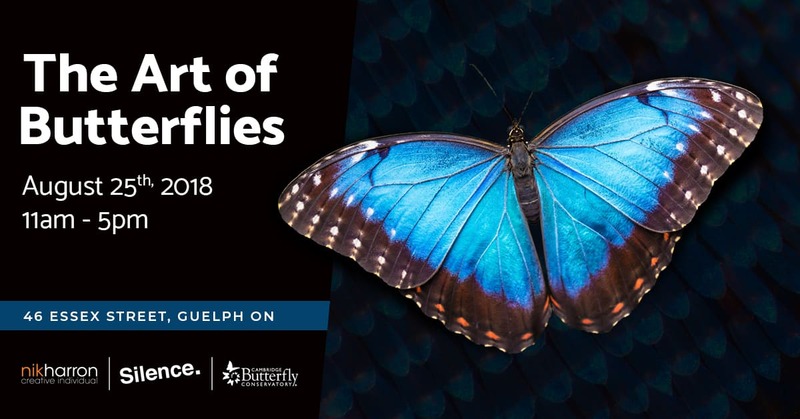 Silence, Cambridge Butterfly Conservatory, and nik harron, in partnership with Guelph Destination Animation Project, present “The Art of Butterflies,” on Saturday, August 25, 11 AM – 5 PM. The project is a free, full-day family event at Silence, 46 Essex Street, Guelph! The Art of Butterflies will be featuring workshops, presentations, an art exhibition for adults and children, live butterflies, and a unique sensory experience created by artist nik harron, entitled, “MORPHO”. nik’s interactive project will be presented throughout the day and explores a musical world of tiny sounds that interact with digital butterflies made of light. nik harron’s latest interactive project combines projected real-time sound visualization with a tactile sound sculpture butterfly that enables viewers to create their own unique experience. Fun activities for the whole family are scheduled throughout the day on August 25. There will be arts and crafts activities including creating butterfly mobiles at 11:30 AM; making butterfly magnets at 1:15 PM; and constructing butterfly origami at 3 PM! Further activities are scheduled including a presentation on Monarchs at 12:30 PM; and butterfly and pollinator gardening at 2 PM. Space is limited for arts and crafts sessions and presentations. Please arrive early to make sure you get a spot! In conjunction with “The Art of Butterflies” event, visual artists, 18 years of age and up, are invited to participate in our Juried Art Exhibition. The exhibition is free of charge to enter. All artwork must contain a realistic, or abstract image or element, of a butterfly. Work must be 2-dimensional and no larger than 18 x 24 inches. The exhibition will be on display August 25 – 31, with an opening reception and awards ceremony for best-of-show on the day of the event, August 25, 4-5 PM. The entry deadline is August 10. In addition, on August 25, The Art of Butterflies will feature a children’s art exhibition. Youth, 18 years of age and under, are invited to drop by Silence to create a work of art, inspired by live, caged butterflies! Artwork may be taken home or hung in our special room. The children’s exhibition is not juried – all may enter. Drawing materials will be supplied, free of charge. The Art of Butterflies is a free event and street parking is available. Silence is located at 46 Essex Street in Guelph and is physically accessible.